This Detroit obscurity has long been a favourite of mine. 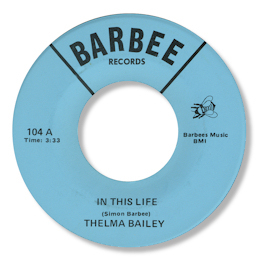 Thelma has a righteous gospel feel to her voice and a splendid deep tone – she must have sung a lot in church. The pop/gospel lyrics may have suited her better than straight forward soul. The “thin” strings add an unusual touch, but the more conventional female chorus are really fine. This was written by the Reverend Simon Barbee who also had a couple of releases on the Barbee label which I believe was owned by long time record store man Elmer Barbee.